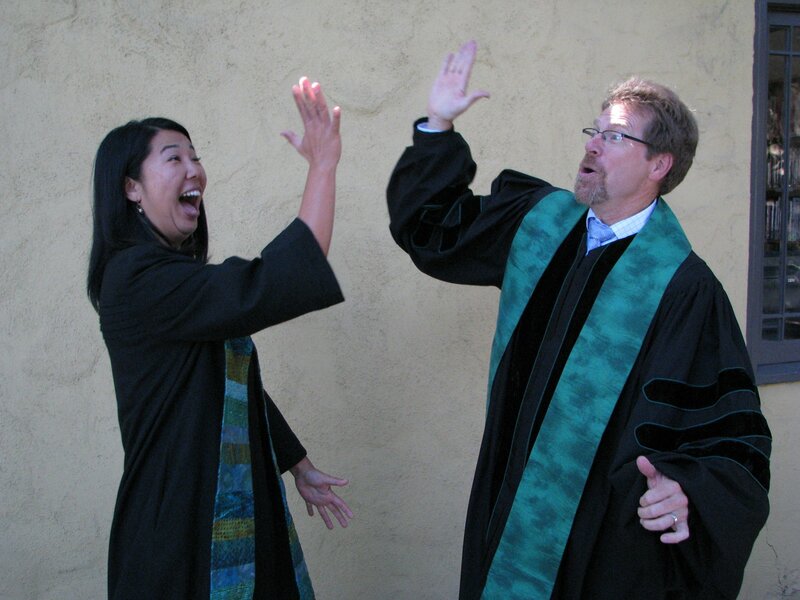 When I walked into my new office on August 1, 2012, I walked in as a half-time “temporary supply” associate pastor for a “new” church called Stone Church of Willow Glen. A year and a half later, I am now full-time and the congregation and San Jose Presbytery have affirmed my call to this church. A year and a half after sharing in ministry with Stone, I will become officially official. If you haven’t already heard, my installation service will be held on Sunday, February 16th at 3:00PM at Stone Church. A year and a half later, I am just as thrilled as I was walking in nervously that first day to be part of this community of faith. So, just for fun, I thought I would share 3 things I’ve learned about Stone Church and about me as we walk faith together. I’m framing this as my way of speaking to the congregation–but you should read it because we really are a cool community. Stone Church is a progressive, caring community of all sorts of people. We wear our rainbow flag with pride, we are an earth care congregation and business, we educate ourselves about issues such as torture, human trafficking, homelessness, and we actively seek ways to promote justice in all areas for our community and the world. Long -time members and people who walk in our doors for the first time are not always long time members of the Presbyterian Church (U.S.A.). Some are former (or current) Catholics, some grew up Baptist, Lutheran, Methodist, some have no religious affiliation prior to coming, and some have a Jewish background. But we seem to hold the shared value of inclusion, welcome, justice, and human kindness for all people. It seems to be the heartbeat of this chur ch and it’s palpable. No matter how we come, we are willing to meet each other where we are, and walk together in faith from that point. We are a majority Caucasian congregation. I’m noting this because after serving a primarily Asian American congregation for four years and coming to Stone Church, it is something I noticed right away. I am sure you know this fact, but maybe do not really notice it. I wanted to share this because I think it is something we as a church should notice. It is a growing edge for us as a congregation. God is doing something great in this place, and as much as I know we want to believe this is something that should not matter, for people of color, it still does. I’m happy to be a person of color as part of the leadership of this church, and even more excited to tell you that I will be the FIRST person of color installed as a pastor at Stone Church. This is good news for all of us as we continue to seek ways of inclusion and welcome. God is doing something amazing in this place. There’s nothing more to say than that. Something is happening and has been happening—Ken and I have conversations about how it feels like God has come to us and we are free to use the gifts we have been given for ministry in this place. We now have ASL (American Sign Language) interpreters provided in worship and through that ministry, new members have joined our community. We have angel grants, where you can take an idea you might have to serve the community here or at large, and put it to action. People step up to provide meals, visit the sick, and find ways to serve beyond our doors. I wake up every day thankful to be part of this community and thankful to be known as one of the pastors here. I’m looking forward to the journey, and thrilled to be sharing it with Stone Church as we take the next step. 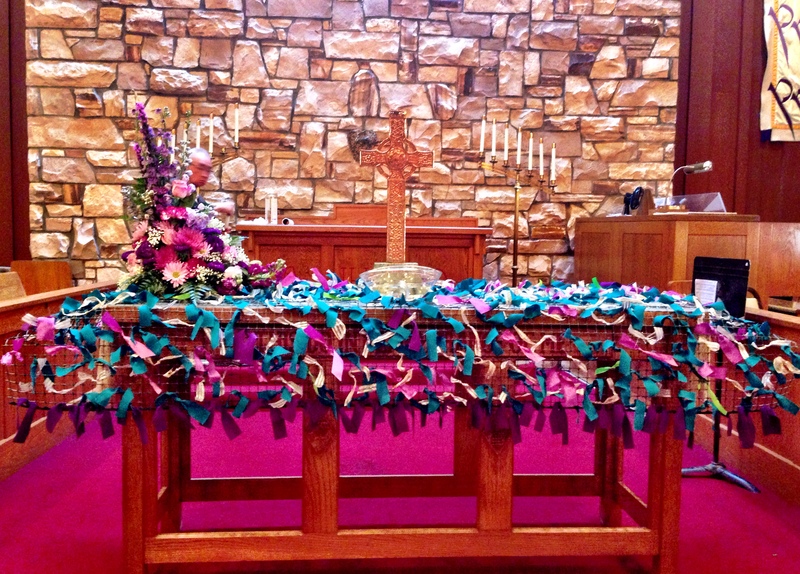 Prayer ribbons tied together over the course of many weeks and laid out over the Communion table as a visual Prayers of the People. Terrific, Irene! Good work in a good place. Especially happy to see a mainline church providing ASL interpreting services (my eldest daughter is deaf) — happens all too rarely. Blessings on this continued ministry. Excellent and Congratulations. May God open our eyes in order to see beyond our limits.